Jyväskylä is a city and municipality in Finland and in the western part of the Finnish Lakeland. Kick off your visit on the 11th (Thu): test your team's savvy at popular escape rooms, look for gifts at Punnitse & Saasta, then get a new perspective on nature at Natural History Museum of Central Finland, and finally get engrossed in the history at Finnish Air Force Museum. Keep things going the next day: see the interesting displays at The Alvar Aalto Museum, contemplate in the serene atmosphere at Petajavesi Old Church, and then hit the slopes at Himos Ski Resort. To find traveler tips, other places to visit, maps, and other tourist information, you can read our Jyvaskyla trip itinerary maker tool . Helsinki to Jyvaskyla is an approximately 3-hour car ride. You can also take a train; or fly. Traveling from Helsinki in April, you can expect nighttime temperatures to be slightly colder in Jyvaskyla, with lows of -3°C. Wrap up your sightseeing on the 12th (Fri) to allow time to travel to Koli National Park. 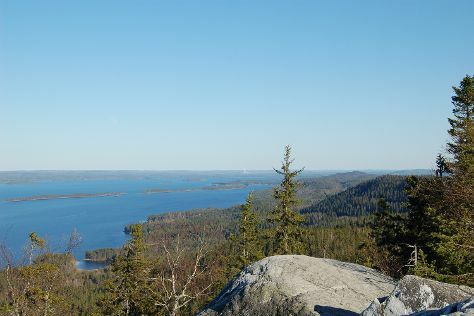 Start off your visit on the 13th (Sat): contemplate the waterfront views at Pielinen, then examine the collection at Koli Nature Centre Ukko, and then tour the pleasant surroundings at Ukko-Koli Hill. To find other places to visit, photos, where to stay, and more tourist information, use the Koli National Park day trip planning website . Traveling by car from Jyvaskyla to Koli National Park takes 4 hours. In April, daytime highs in Koli National Park are 6°C, while nighttime lows are -2°C. Wrap up your sightseeing on the 13th (Sat) to allow time to travel back home.